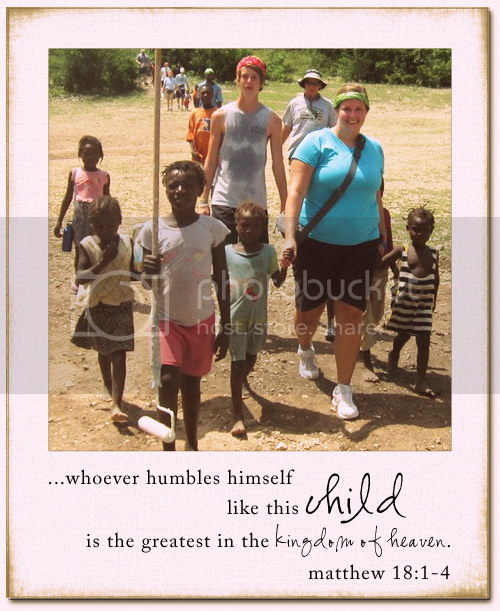 I love this picture of me and the kiddos of Haiti! We are walking back to the church after working on some houses in the village. The children followed us everywhere we went. They just wanted to be near us. They would carry our paint brushes and buckets just so they could hold our hands. The little girl in the pink is even carrying my water bottle! :) I would feel bad because they were so little and I didn't want them to be carrying my things, but the joy they got from knowing they were helping me out and getting to hold my hand at the same time was priceless. I love them. I miss them. I need to be back with them!! Didn't get a chance to read about my trip to Haiti? Find it here.